There will be 5 rounds counting the best 4 results. It will be based on a league rather than automatic qualification. Points will be awarded depending on where you finish in the section. First – 1 point, Second – 2 points, Third – 3 points and so on. 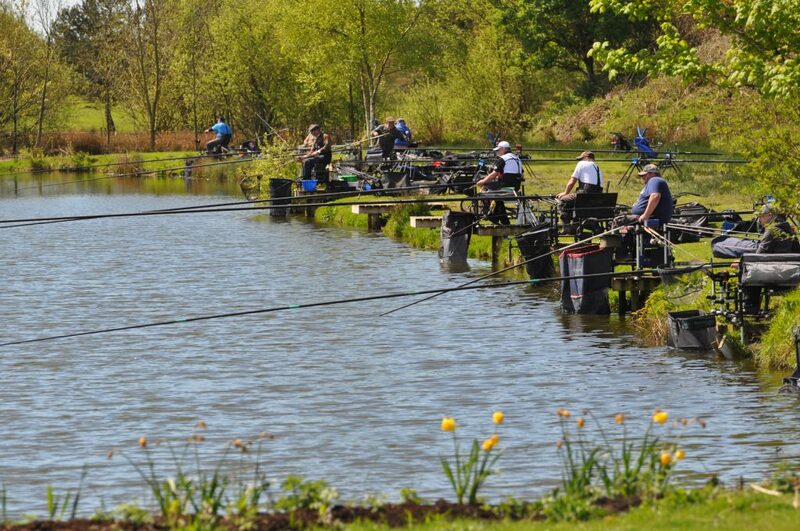 DNW will receive 7 points, regardless of how many anglers weigh in or are in the section. If you miss a round you will be awarded 8 points. 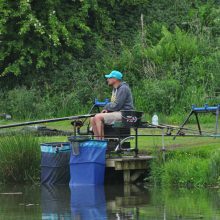 The top 14 anglers with the lowest points from the 5 rounds after dropping their worst result will qualify for the A Final. 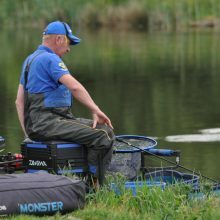 Where points are tied, the angler with the most sections wins will qualify, If still tied then it will be decided on weight. The day started off well, lovely and mild, around 16 degrees, overcast and a nice 12mph wind… The conditions certainly favoured the fish for the first two hours, although things slowed up a bit mid-match with the clouds disappearing and out came the sun ☀..! 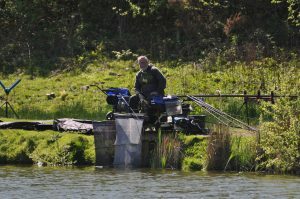 On Queensberry Water there were some lovely nets of fish caught throughout the lake, with carp, ide and skimmers all feeding reasonably well. 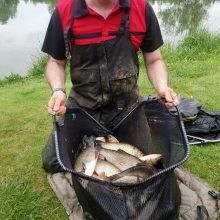 James Woodrow was 2nd in section with a nice net of ide and skimmers for 56lb 8oz, caught on maggot/pole, followed closely behind by Craig Duncan with another good net of ide and skimmers for, 55lb. 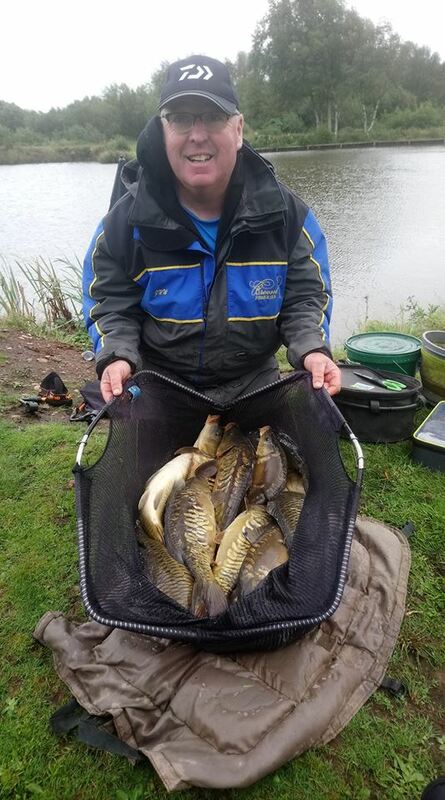 Queensberry Water section 1 saw John Williamson win comfortably with a nice net of quality carp caught on the feeder rod/pellet, making the most of his end peg advantage in a tough section. 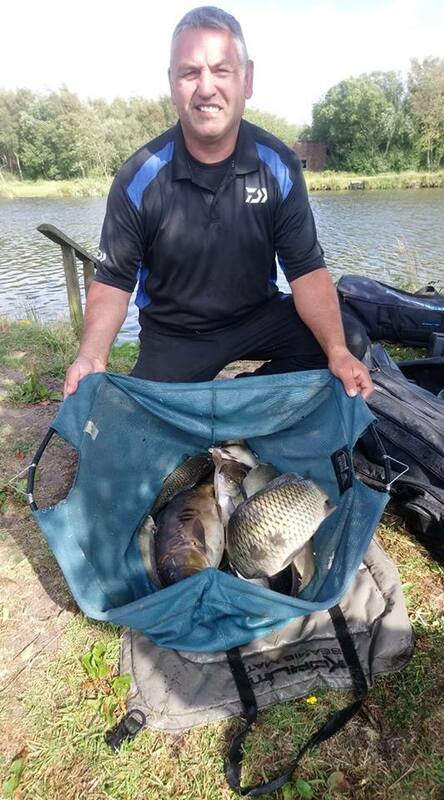 John Wright narrowly took second place with a few nice skimmers and small carp for 32lb 2oz, with Matt Baxter weighing in 31lb 8oz on the next peg, again some quality Carp and big ide. 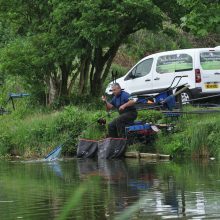 Wallace Lake was a tougher one altogether… The carp not really feeding and the ide feeding in short spells throughout the day. 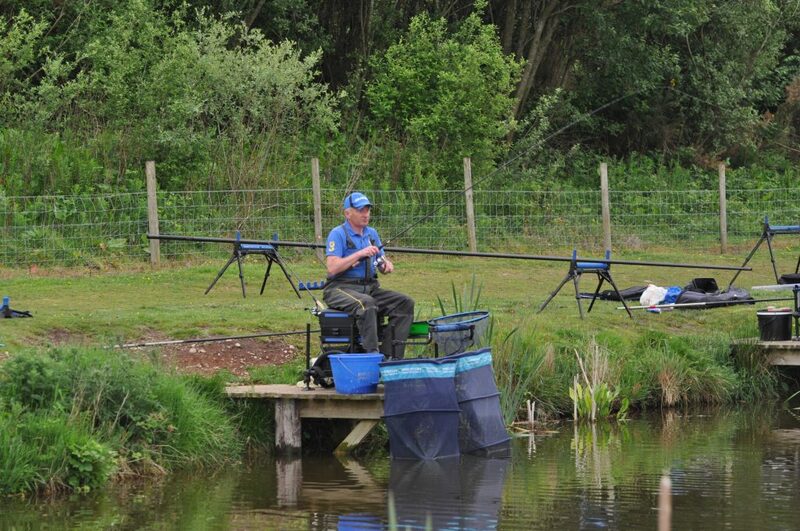 Section 1 was won by Mark Clow, Mark did well to win his section from peg 35, up against hot peg 32. 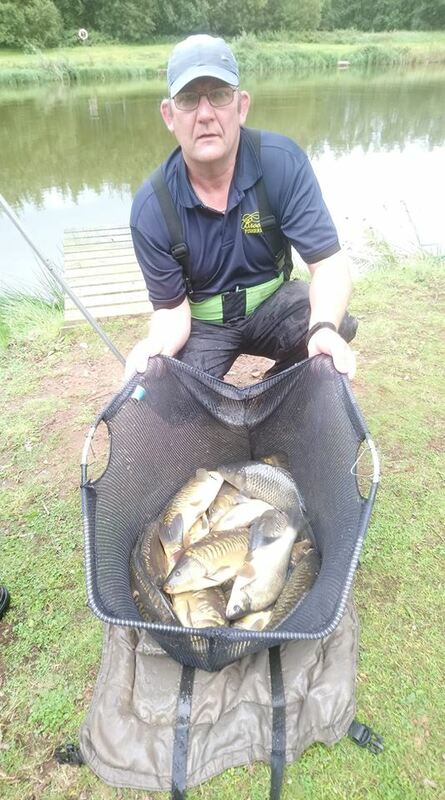 Luckily the carp were having none of it today, and Mark got his tactics right targeting ide to win with 31lbs 4oz, with Simon Heyes on peg 32 netting 10 small carp for 23lb 10oz and 2nd in section. 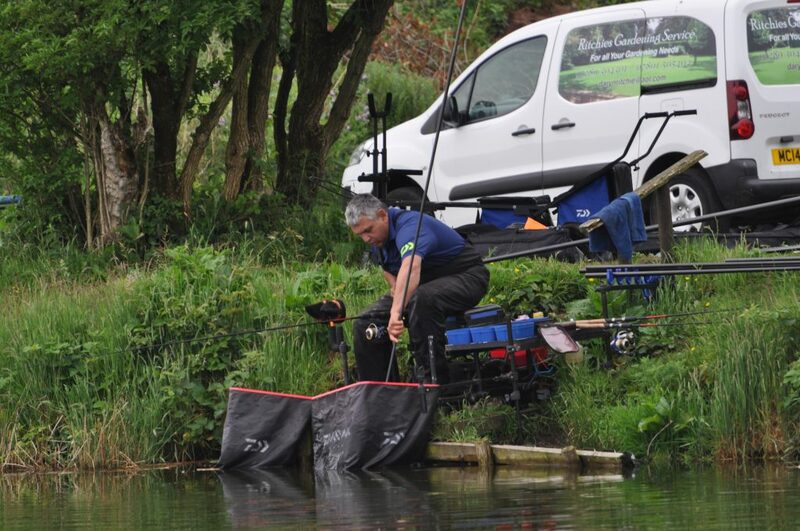 Steve Royle won from end peg 47 by the narrowest of margins… 4oz to be precise..! 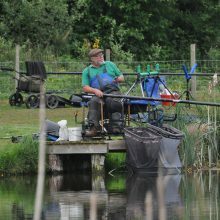 With the help of 5 small carp late on and a few small ide and skimmers, he weighed in 30lb, 4oz. 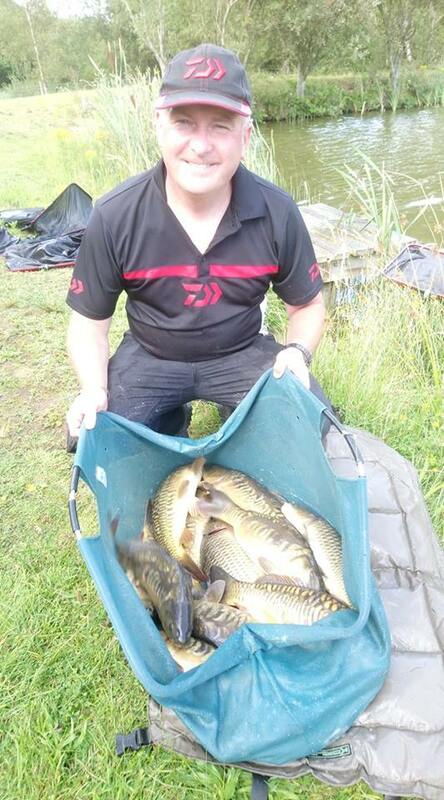 Rosen Arson was very unfortunate to finish 2nd with 30lb, a mix of small carp and ide. Myles watt (. 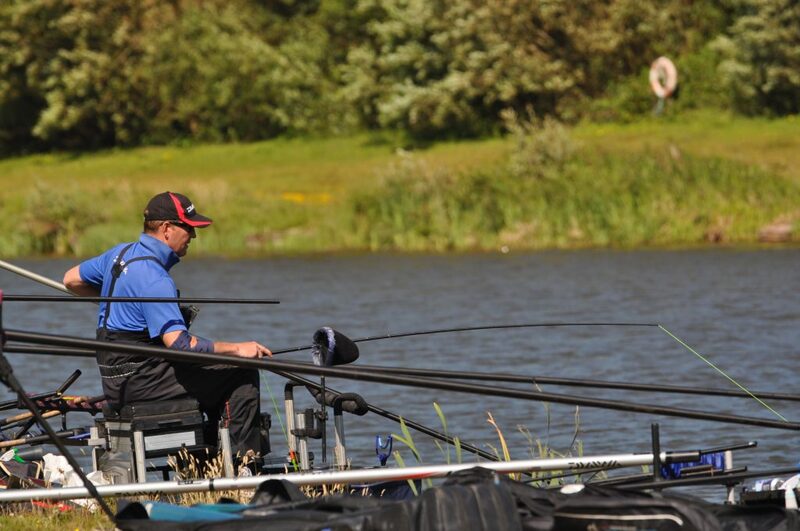 27lb 4oz ) & David Corcoran (. 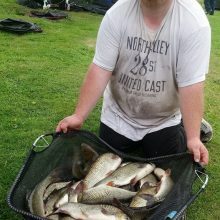 26lb 10oz. ) followed on closely behind. 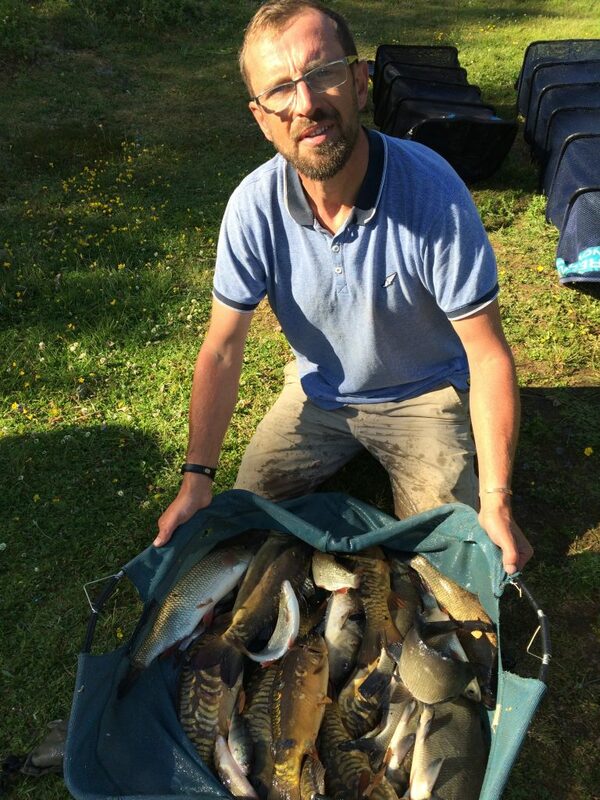 Some nice catches throughout today despite the bright sunshine… Well done everyone..! 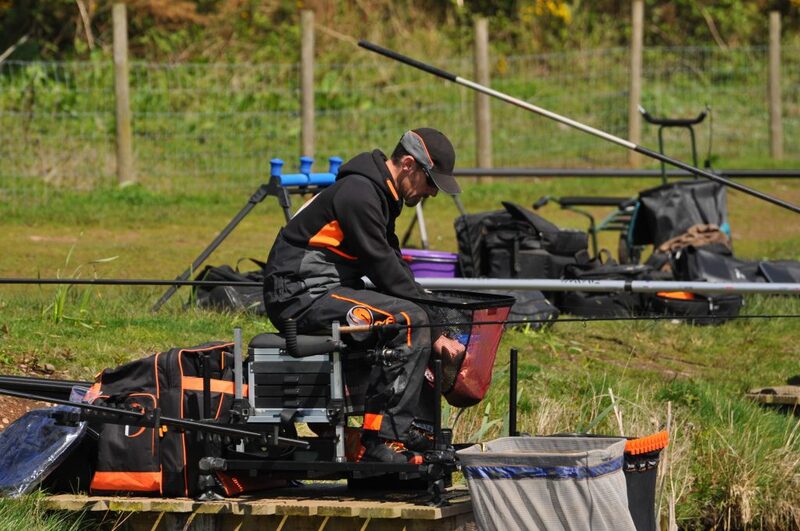 4th – Matthew Waugh – 42lb (p19). 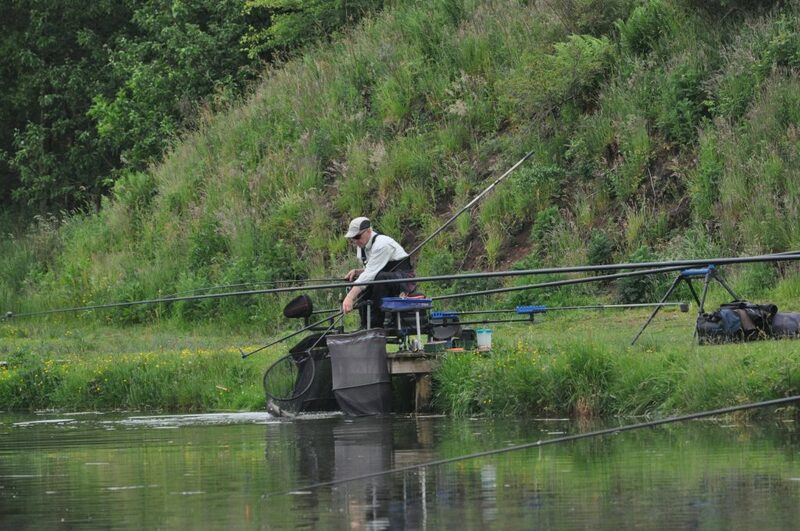 Almost perfect conditions today, very mild and overcast all day, the only thing missing for once was a ripple..! 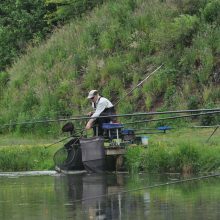 Despite the flat calm conditions, the fish in Queensberry Water wherein the mood to feed, or at least the silvers were. 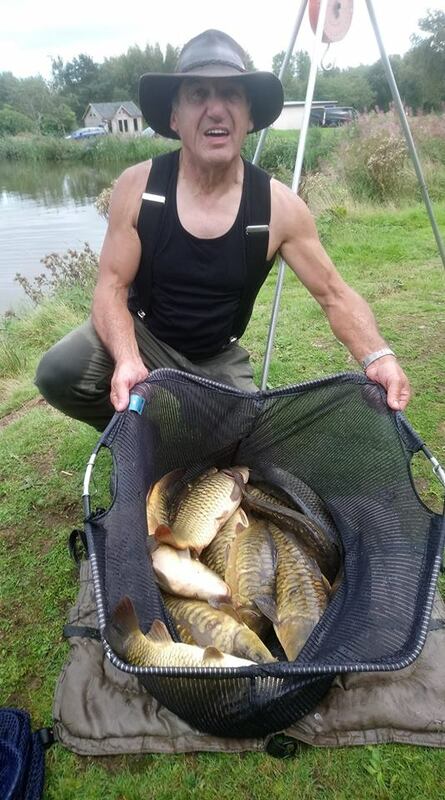 Some lovely nets of big ide and skimmers were caught, along with quite a few smaller carp and F1s, and the odd big one just for good measure. 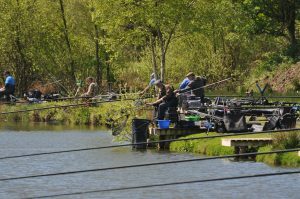 It was very apparent the majority of the big carp were spawning, with lots of floating weed and rushes floating around the lake..! 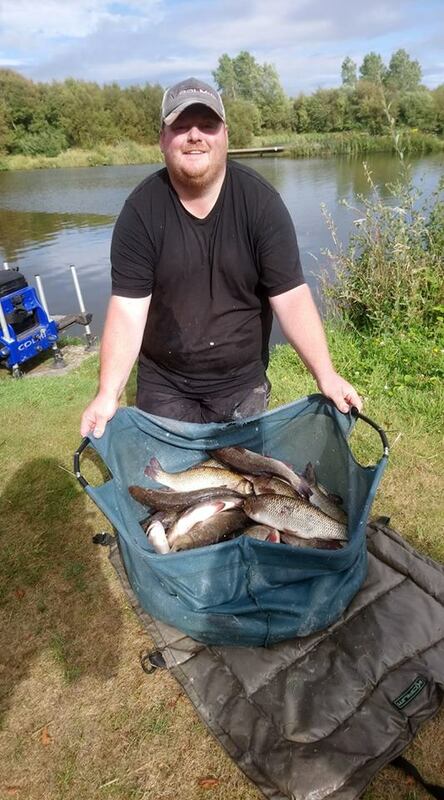 James Woodrow won section 2 with over 50lbs of silvers caught on maggot/pole, and another 39lbs of carp caught in his margin to weigh in a superb 89lbs 8oz. 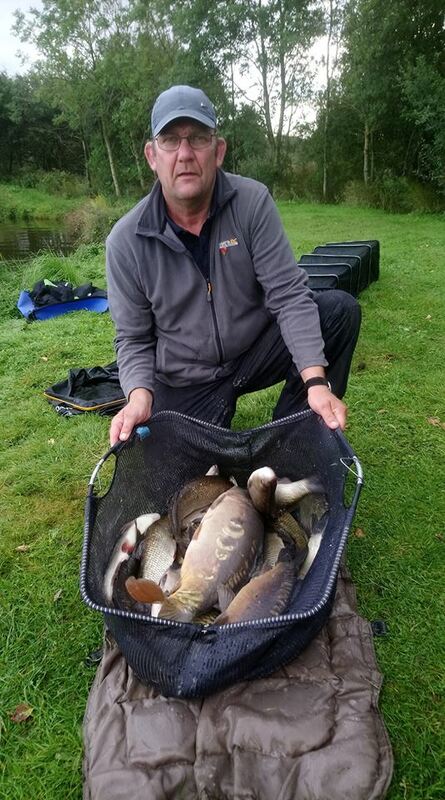 Ian Whitson finished 2nd in section with a very respectable 56lbs 4oz, a mix of silvers and carp, followed closely behind by Steve Royle with 54lb 8oz in 3rd place. 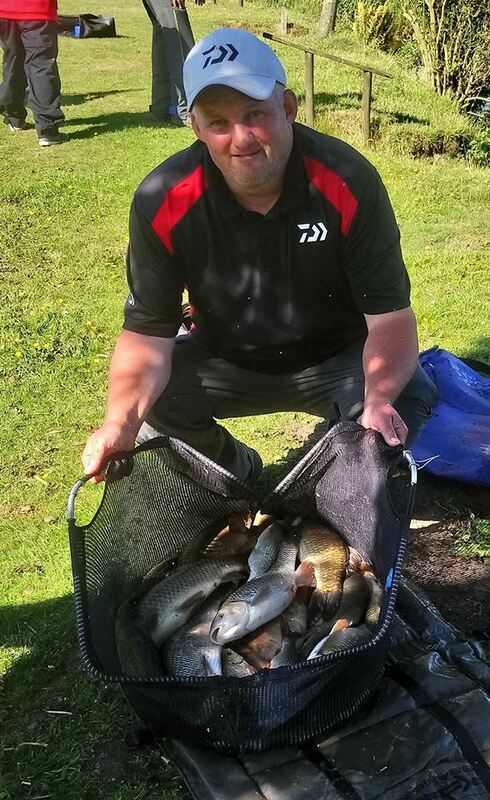 Section 1 was won by Darren Peel, and again Darren had over 50lbs of silvers on maggot/pole, with a few nice carp from his margin to weigh in 75lb. 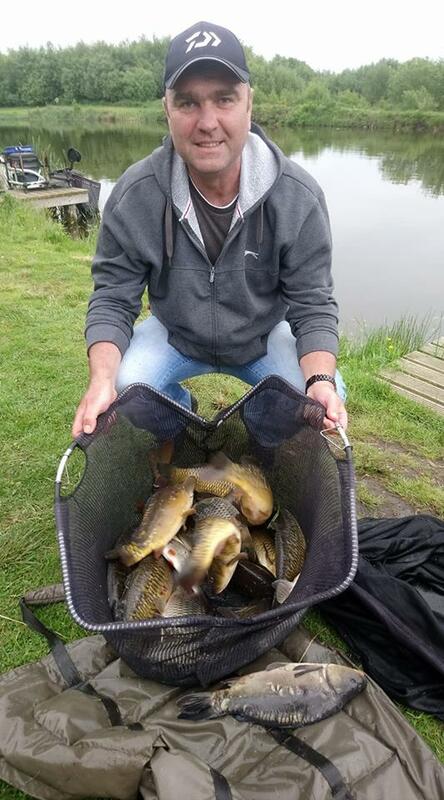 James Dornom finished 2nd with a nice mix of skimmers, ide and small carp, all caught on pole, with Barry Young a respectable 3rd with 44lb. Wallace Lake was a tougher affair, but the sections were tight. 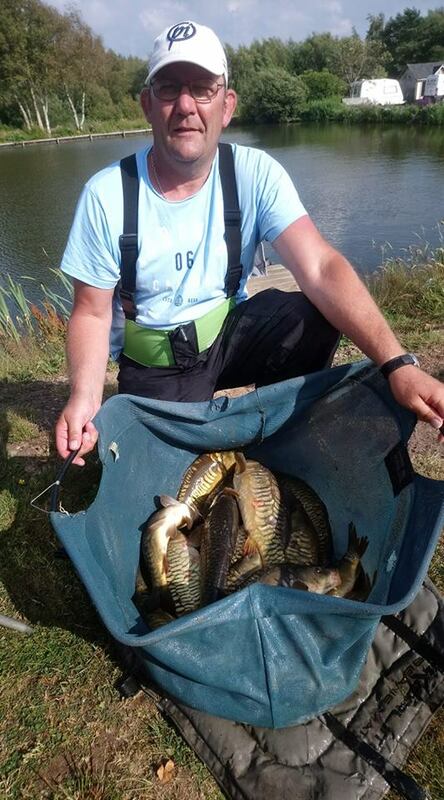 Section 1 was won by Rosen Arsov, who weighed in 37lbs 6oz, all small carp caught on method feeder. 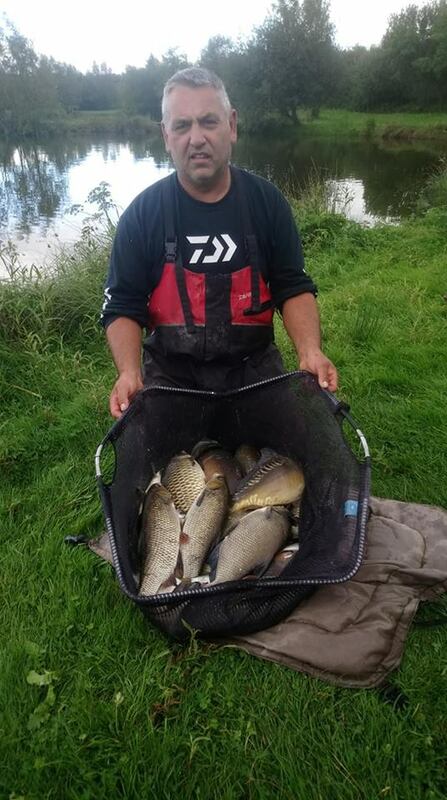 John Wright finished a very close second with 36lbs 4oz, a mix of small carp, ide and skimmers, caught on pole/maggot and the method feeder. 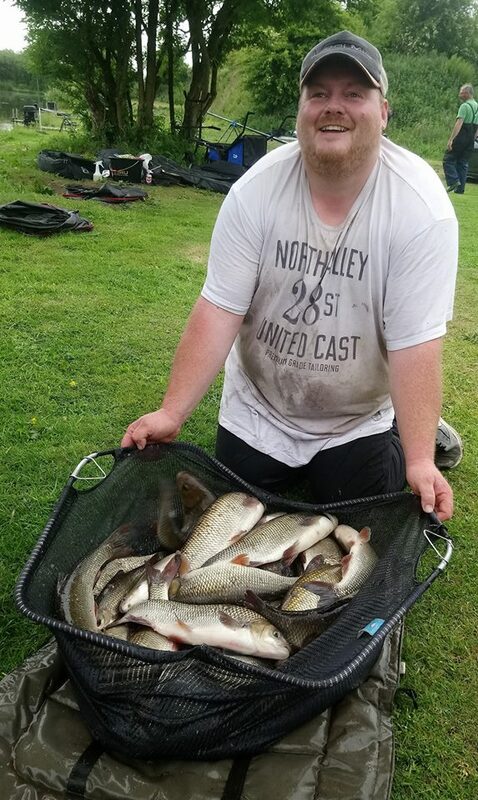 Nick Aldersey was a respectable third with 23lbs. 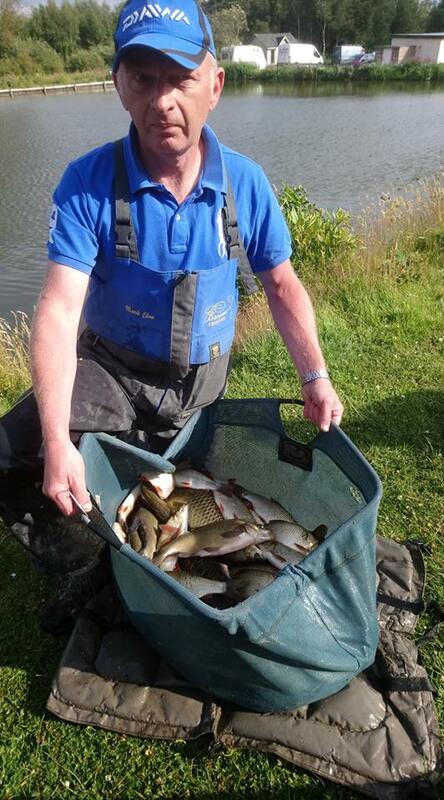 Section 2 saw David Corcoran come out on top with 27lbs 8oz, a mix of small ide and skimmers caught on pole, maggot. 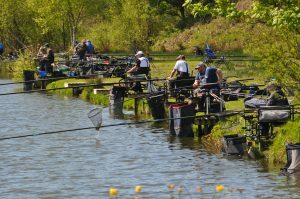 Craig Duncan was a close 2nd with 24lbs, s net of mainly small ide, with John Williamson weighing in 22lbs to take 3rd spot. 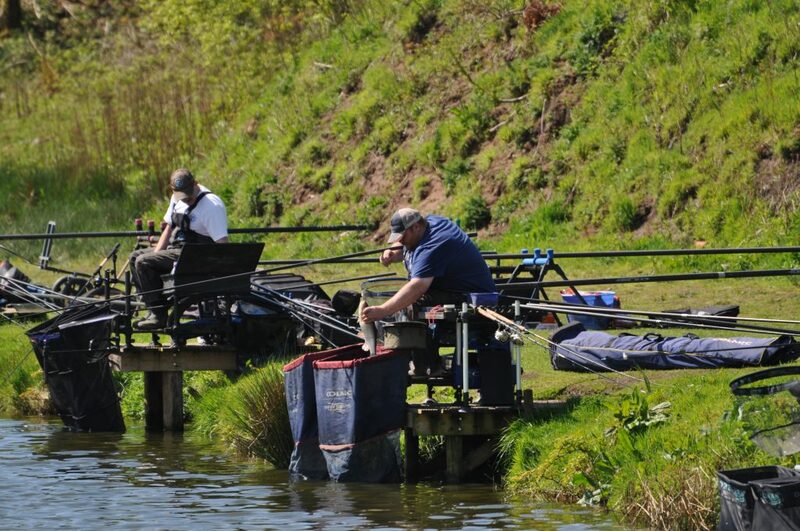 Yet again both end pegs struggled again today… And not the first time, who says they can’t be beaten..??!! Well done everyone some cracking weights again, even more so that the majority were silvers.! Very bright 🔆, very warm and the 10mph winds forecast were more like 18 – 20mph..! 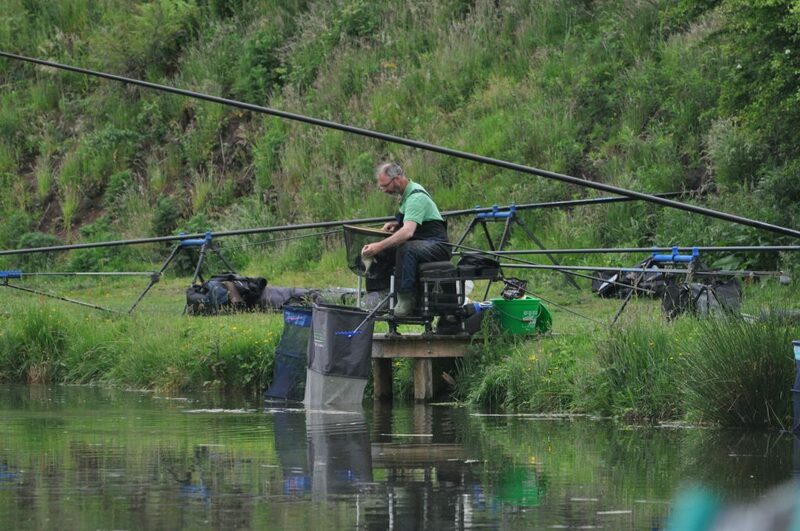 Despite the conditions, some nice weights were recorded on both waters. 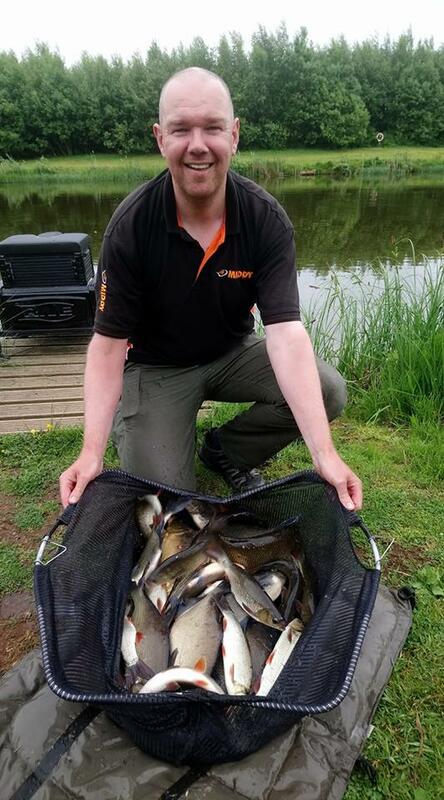 Section 1 on Wallace Lake was won comfortably today by Ian Whitson who’s drawing arm worked its magic again today, drawing peg 32… A few silvers on pole to start off with followed by quite a few carp on the method feeder and pole to weigh in 76lbs 6oz. 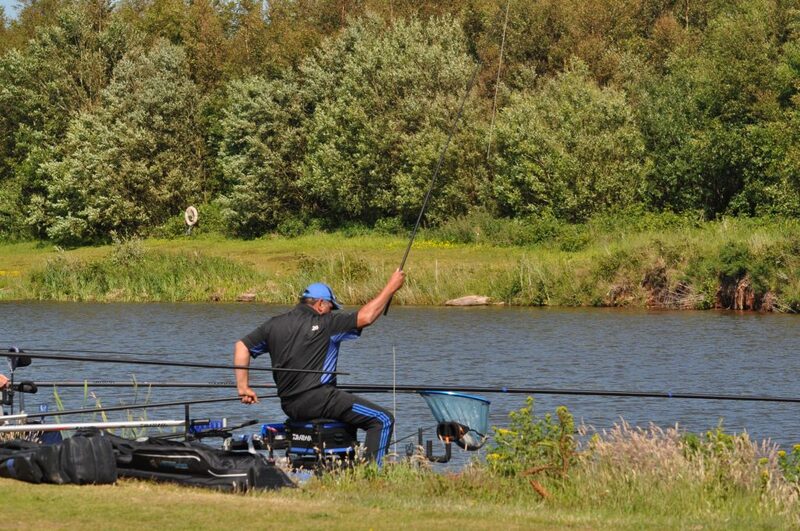 Rosen Arsov kept up his consistent run of late by finishing 2nd in section with 37lbs 4oz. 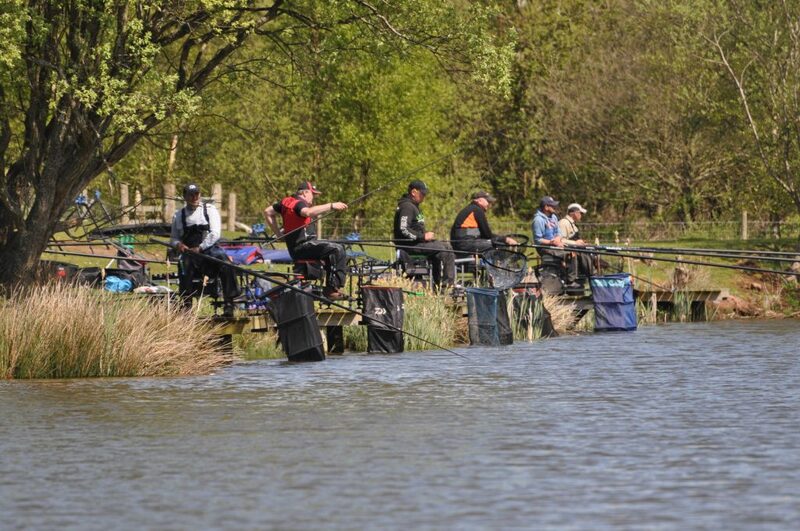 Section 2 was a really tough place to be with some very good anglers all scrapping for points. 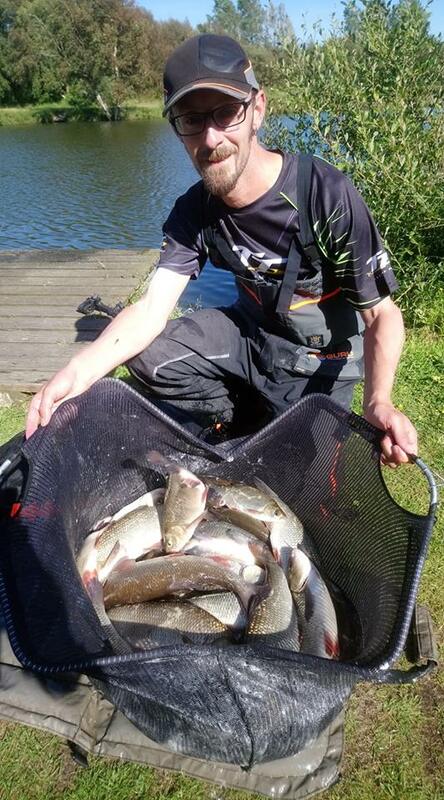 James Woodrow came out on top in a very close section with 43lbs 4oz, small ide, skimmers and carp caught on the pole with maggot/worm. 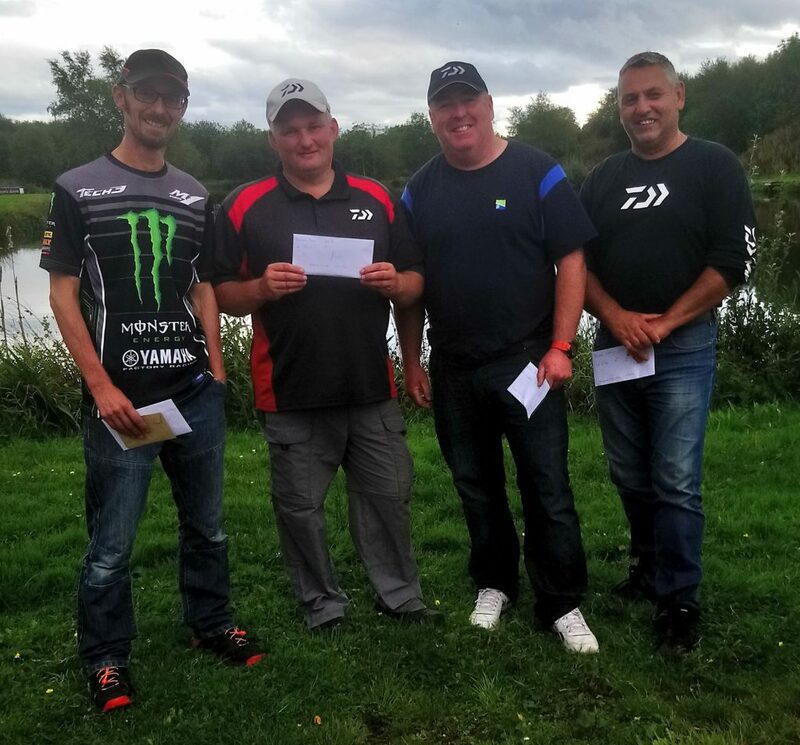 Following closely behind was David Corcoran who took 2nd place with 39lbs 10oz, again ide and skimmers caught on pole, with Myles Watt in 3rd place only a few ounces behind with 39lbs. 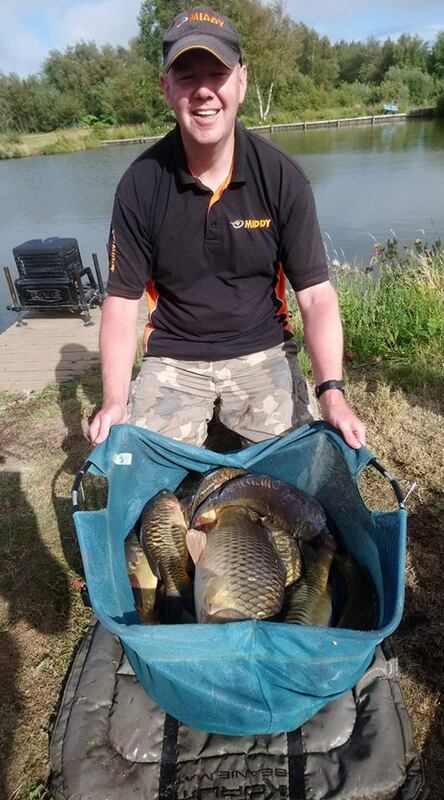 Queensberry Water section 1 was one by Simon Heyes with 62lbs 12oz, his weight made up of 18lbs of carp & 44lbs of big ide and skimmers, all caught on pole, maggot. 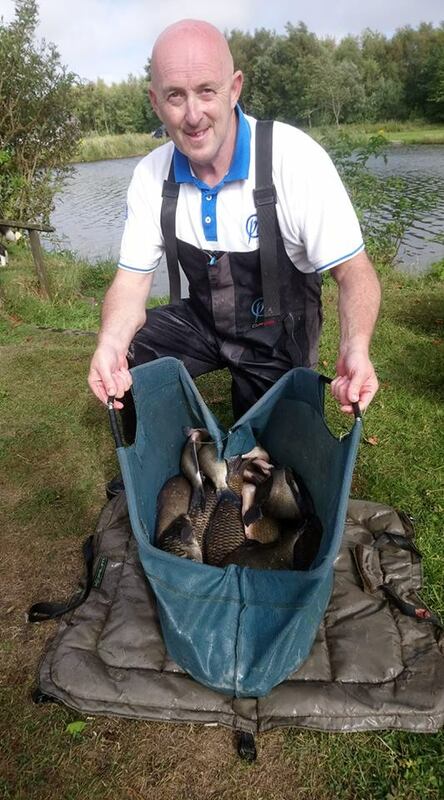 Craig Duncan put in a good shift on peg 19 with a few carp and silvers for 43lb 10oz, securing 2nd place in section. 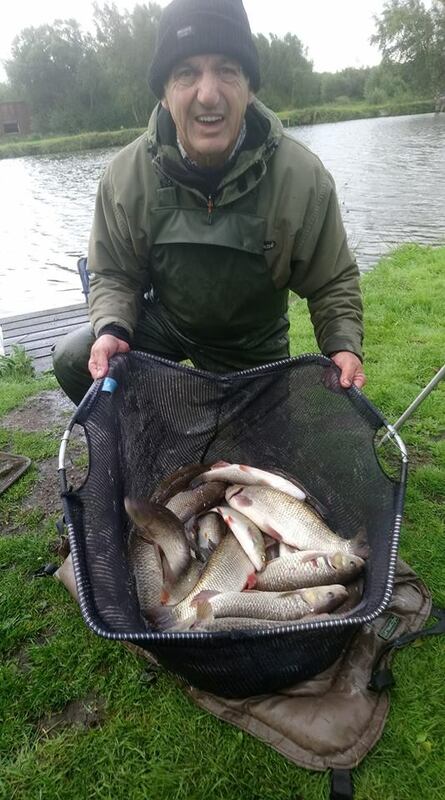 Section 2 was another close one, with Barry Young winning the section with 55lb 2oz, a mix of carp, ide and chub on pole/maggot, and a few carp on the rod. 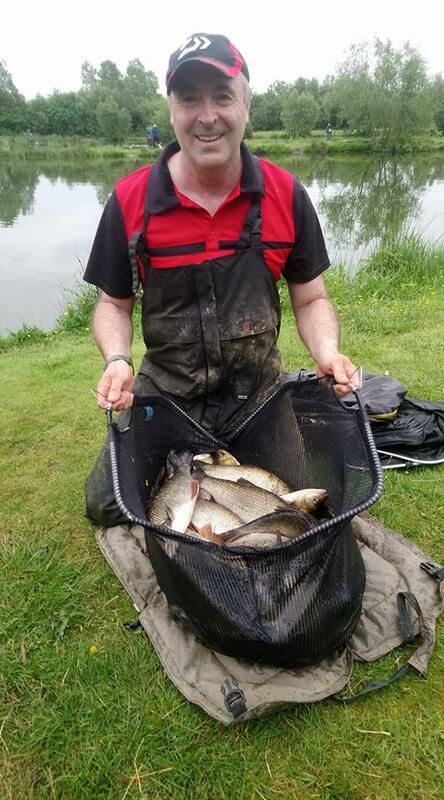 Mark Clow followed closely behind taking second place with 49lbs 14oz, a lovely net of skimmers, chub and ide with one or two carp for good measure, all caught on worm/pole. 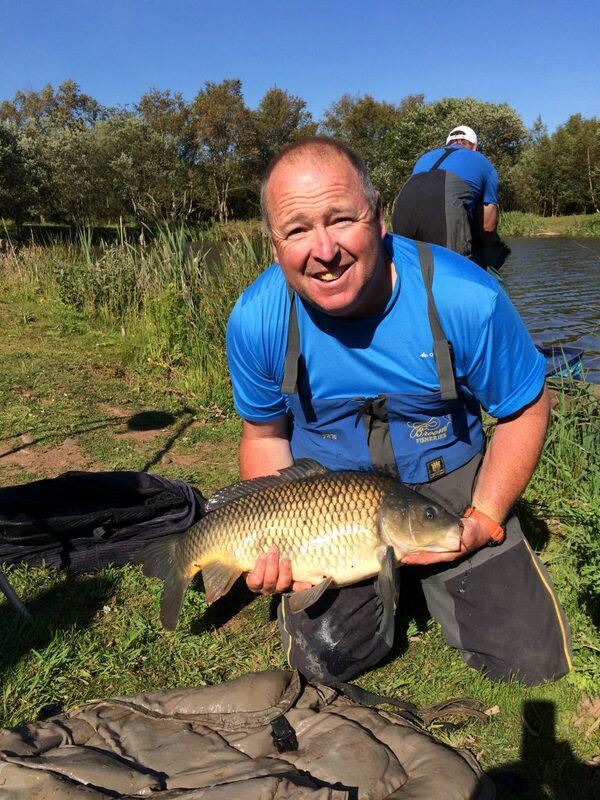 It’s worth mentioning Matt Baxters epic tussle on peg 26, all 40 minutes of it and eventually landing a nice double figure common carp caught on hard pellet/pole. 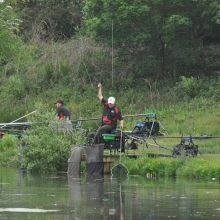 A lovely dry day today but a bit on the windy side for most trying to fish the pole at any distance.! 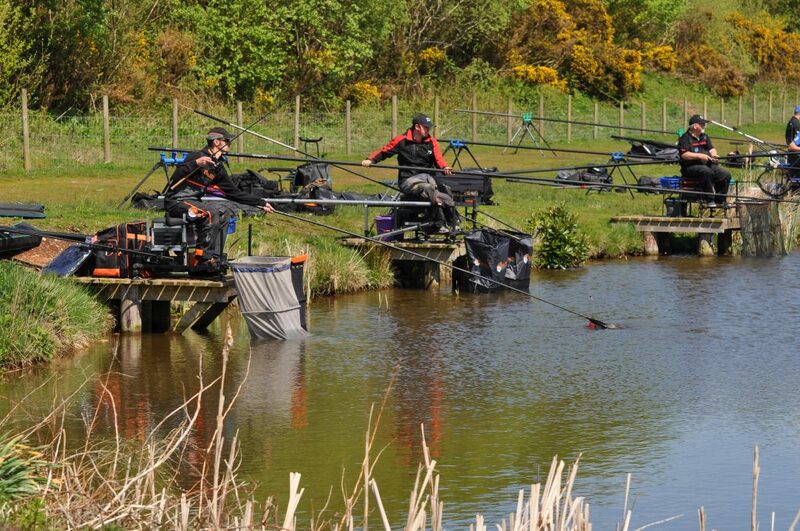 Yet again some great nets of fish weighed in, in all sections involved. 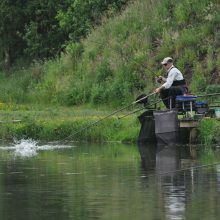 On Queensberry Water, the fish certainly favoured the end with the wind blowing into it, with the other section (1) at the far end flat calm for most. 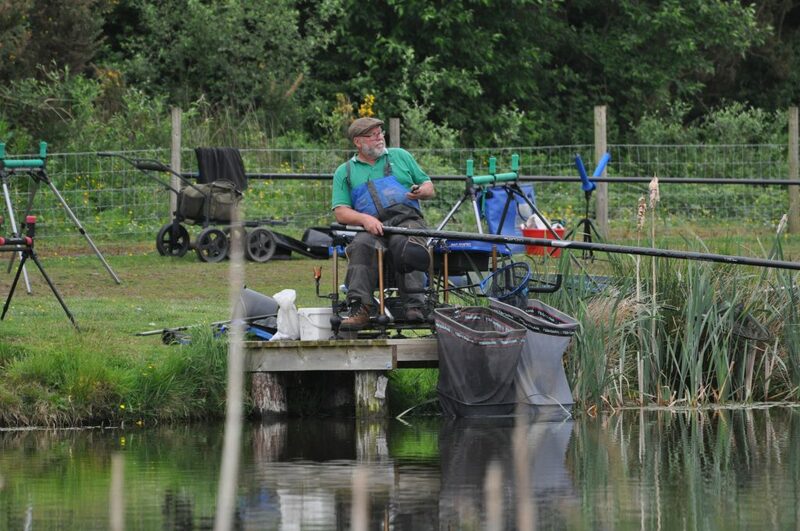 Ian Whitson won section 2 with a mix of silvers and carp for 65lb 12oz, also winning the OVERALL match. 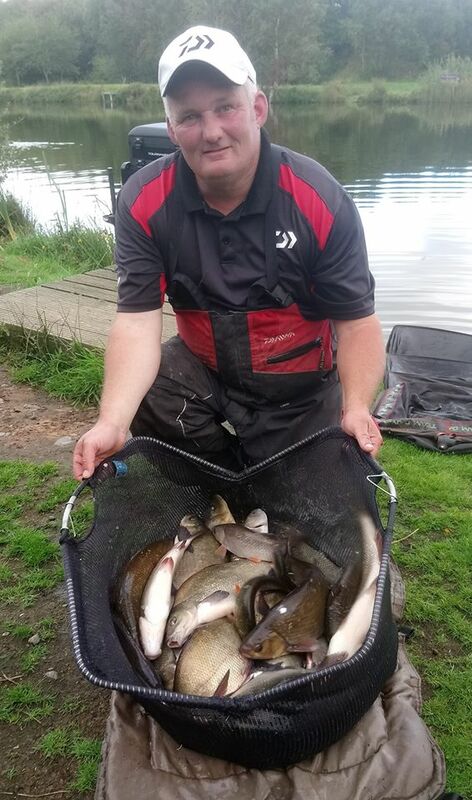 Steve Royle was a very close second with 64lb 6oz of carp caught on the pellet waggler. 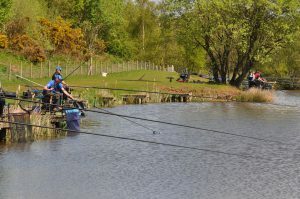 On section 1 things were a bit strange on the pole lines, with the fish “” fizzing “” on the pole lines but feeding off the bottom making them difficult to tempt. 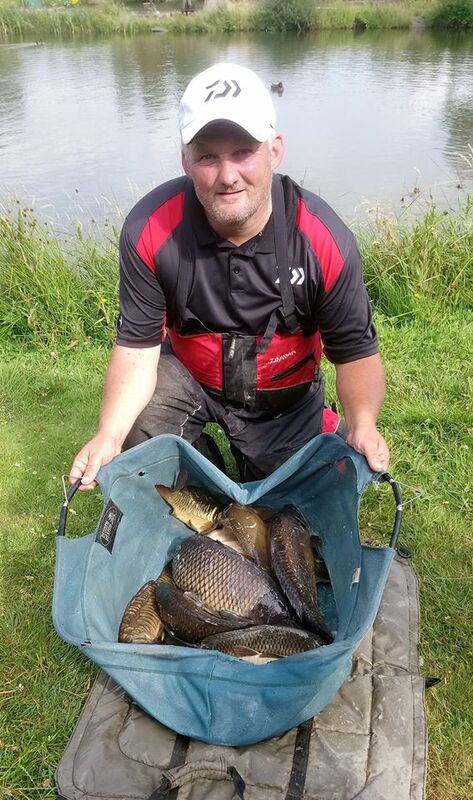 Barry Young got his tactics right fishing the method feeder to net 19 carp, weighing in 55lbs to win the section. 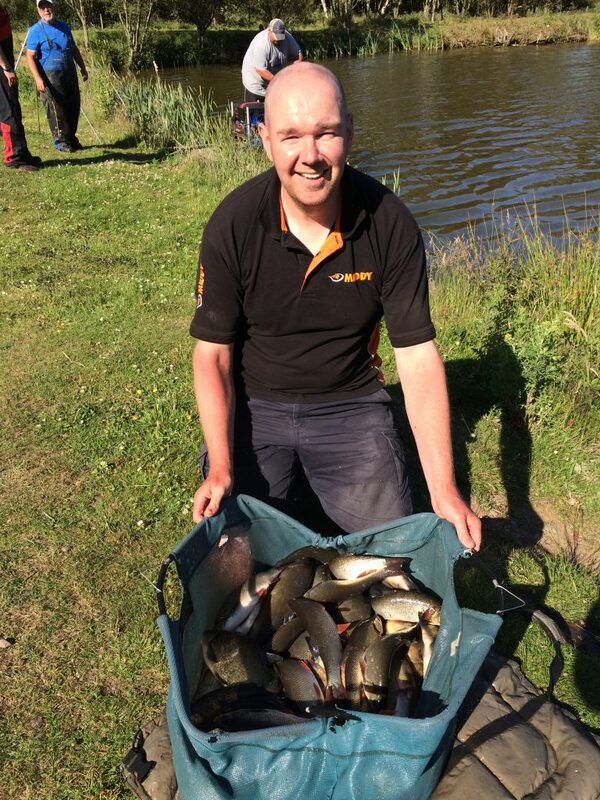 Mark Acton was second on hot 🔥 peg 20 with a mix of silvers and small carp for 31lbs. 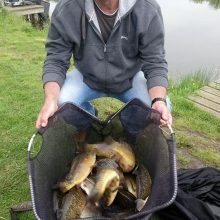 On Wallace Lake Mark Clow won his section fishing the short pole, catching carp and skimmers to weigh in a respectable 62lbs, with Don Lines taking second place on peg 32 with a net of carp caught on feeder and pole for 58lbs 4oz. 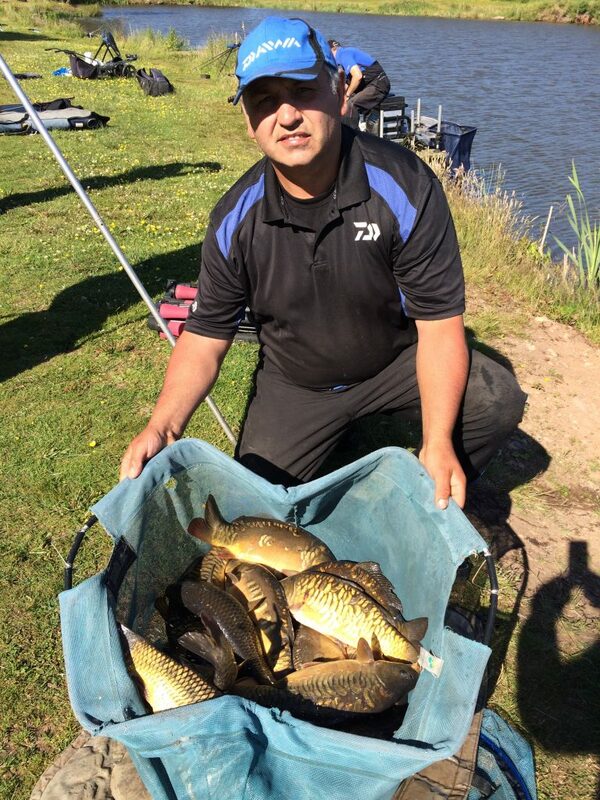 Section 2 saw Rosen Arsov win from end peg 47 with 18 carp caught on tip rod and pole, weighing in 57lbs 10oz. 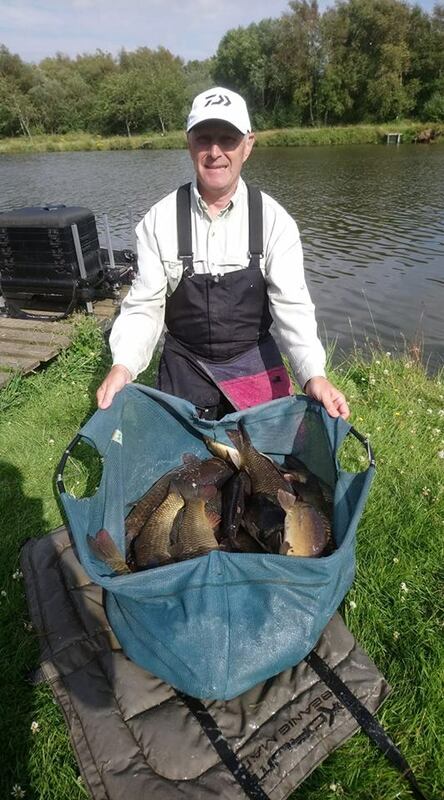 John Wright had a busy days fishing netting 70 small ide to weigh in 48lbs 10oz, taking second place. 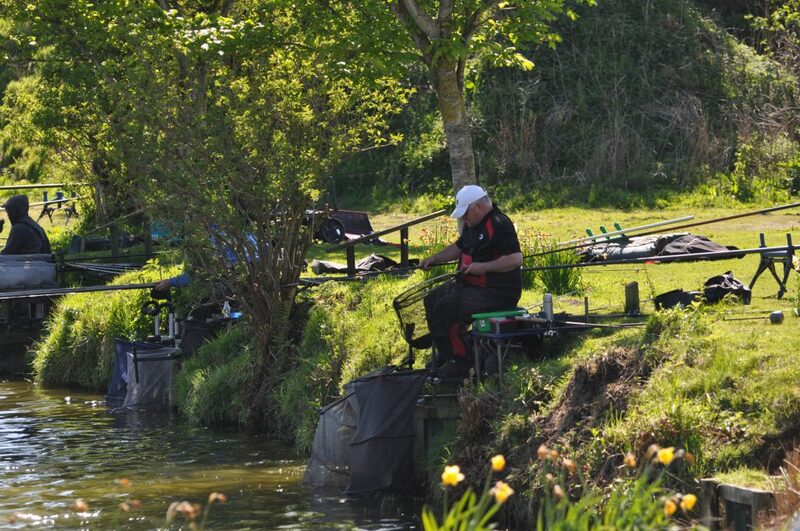 All to fish for going into the last round (5) next Sunday with quite a few anglers in contention to win the league and book their place in the finals. 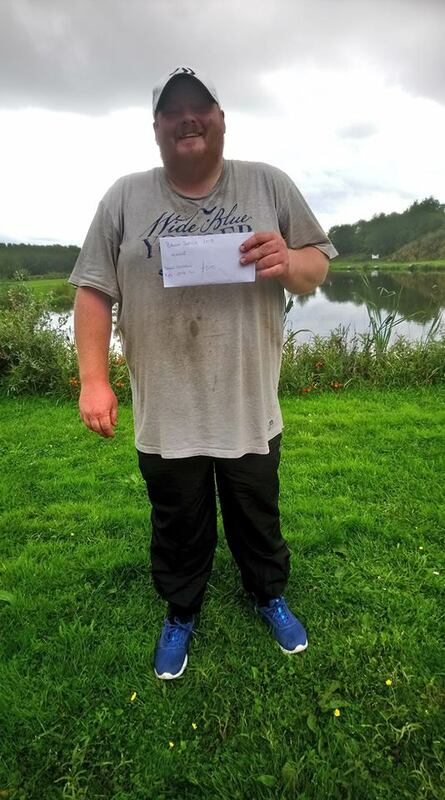 2nd – Barry Young – 57lb 4oz (p33). A dry day, overcast with periods of sunshine ☀, and a nasty gusting wind..! All to fish for today with several anglers in contention to win the league and book their places in the big money 💷 two day ” A” final. 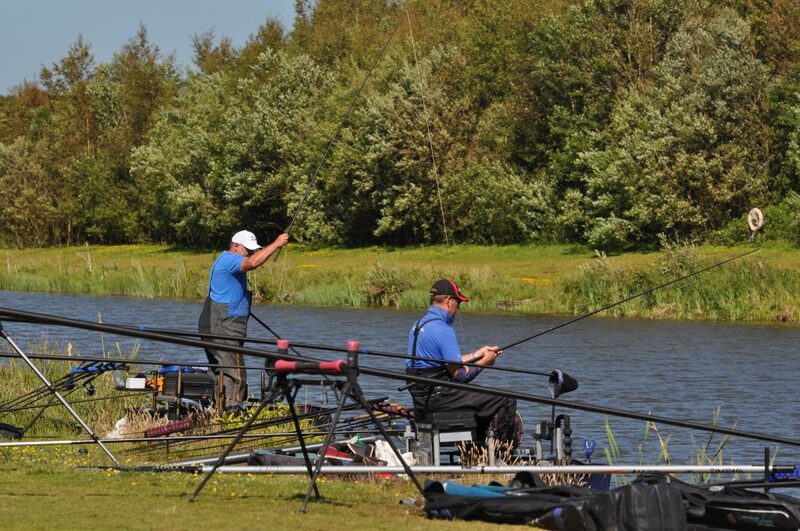 At the start of the day Barry Young had a narrow one-point lead at the top, with three anglers only a point behind. 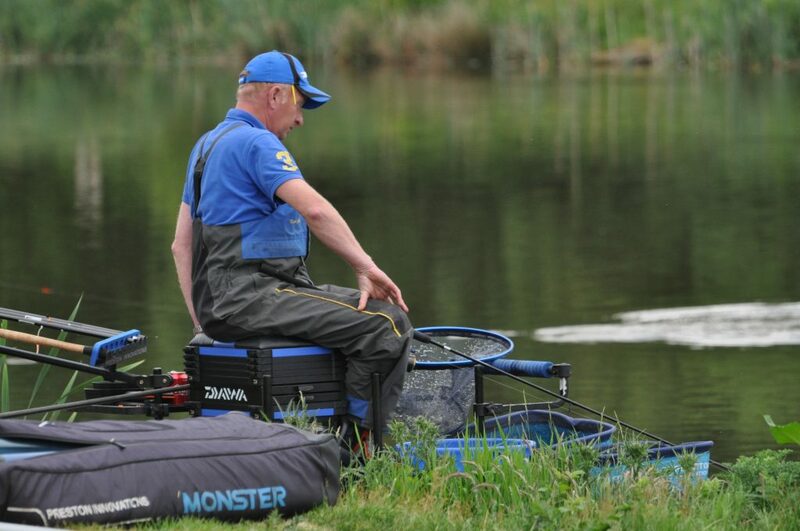 The drawbag would play a part in the proceedings today for all concerned with the league AND places in the finals. 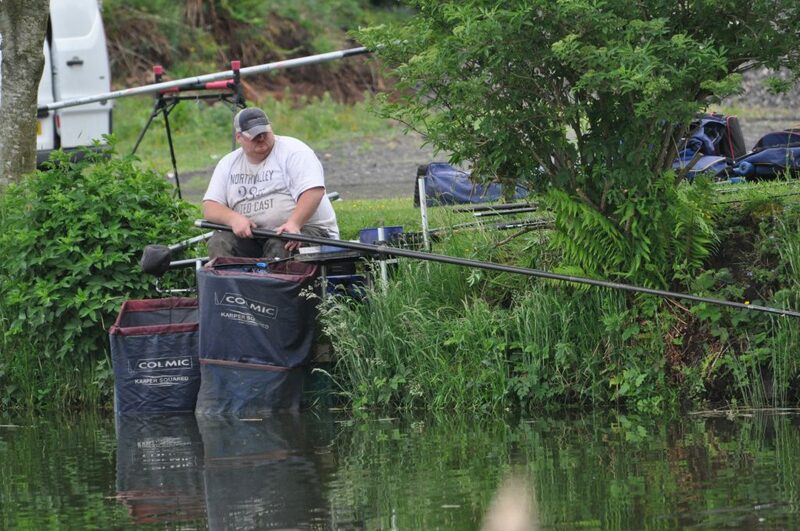 On Wallace Lake, David Corcoran drew hot end peg 32, with Barry Young next door on peg 33. 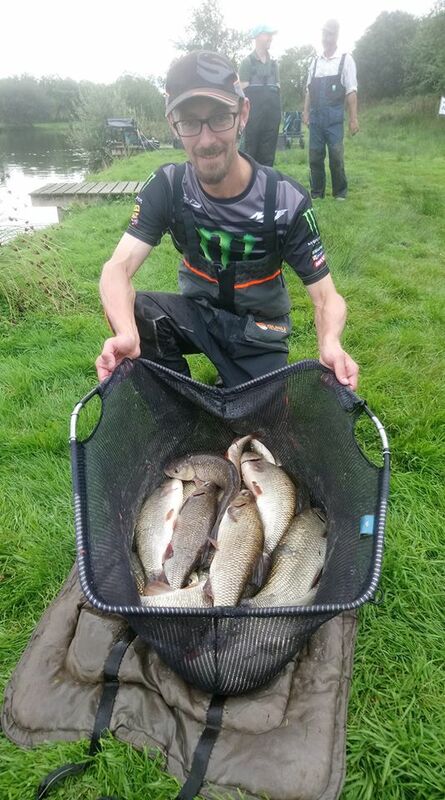 David won the section comfortably with a superb 97lbs of Carp caught on the method feeder and a few on pole in the margin. 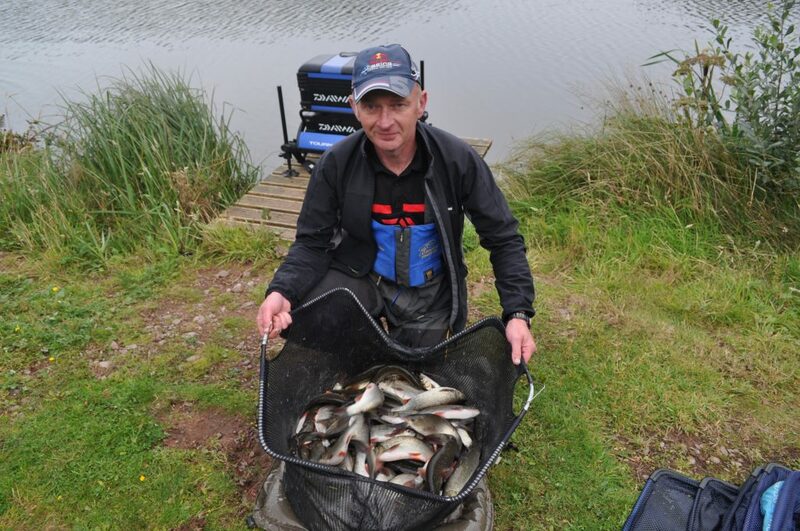 Barry Young kept his good run in the league going with 57lbs + to finish 2nd in section, a mix of ide & carp caught on pole at 13m, giving him a final score of 5pts with his worst score (3rd) dropped. 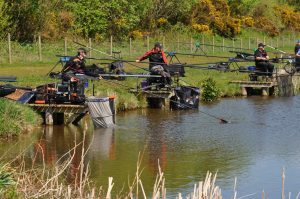 In section 2 Craig Duncan won his section and booked his place in the ” A” final with 64lbs, mainly Carp and ide caught at 11m on pole, with Mark Clow taking second place with a mix of carp, ide & skimmers for 57lbs +. 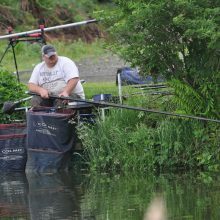 On Queensberry Water section 1, James Woodrow was sitting one point behind the league leader Barry Young, but with Barry only managing 2nd today, he had a real shout to claw back the deficit. 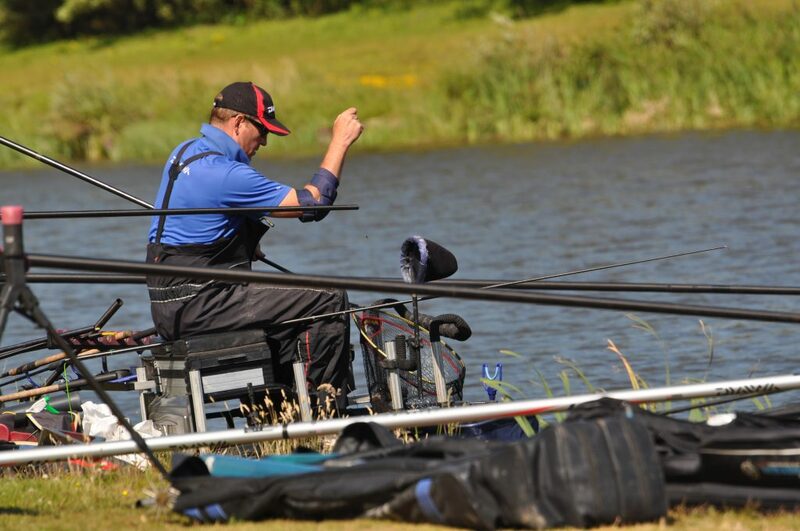 On the scales James weighed in a cracking net of ide and carp for 70lbs 8oz, giving him the section win which would prove crucial as the final results were tallied up. 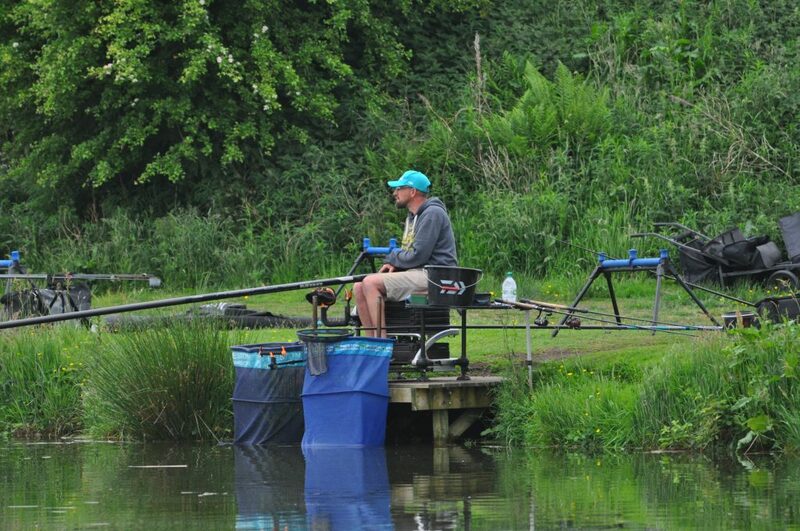 Ian Whitson also narrowly missed out on the league, finishing 2nd in section today with 54lbs 10oz. 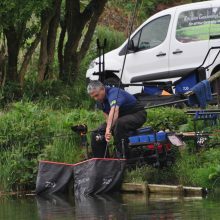 Section 2 saw Mick Slater draw end peg 28, and he put in a sterling performance to win with a cracking net of carp and skimmers for 81lbs 8oz. 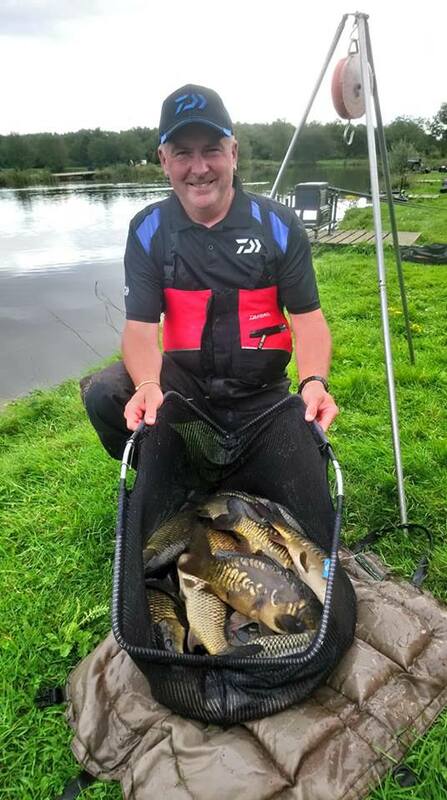 John Wright took the runner-up place with 41lbs 4oz. 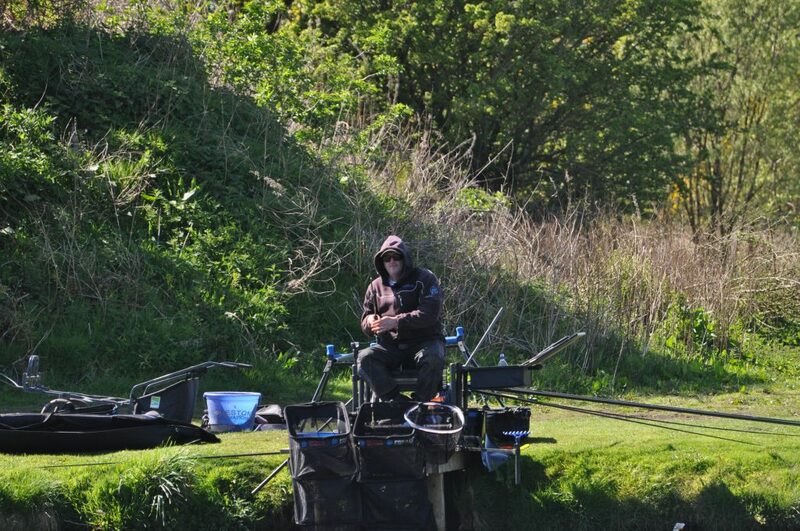 Some excellent weights and very close sections on both waters today. 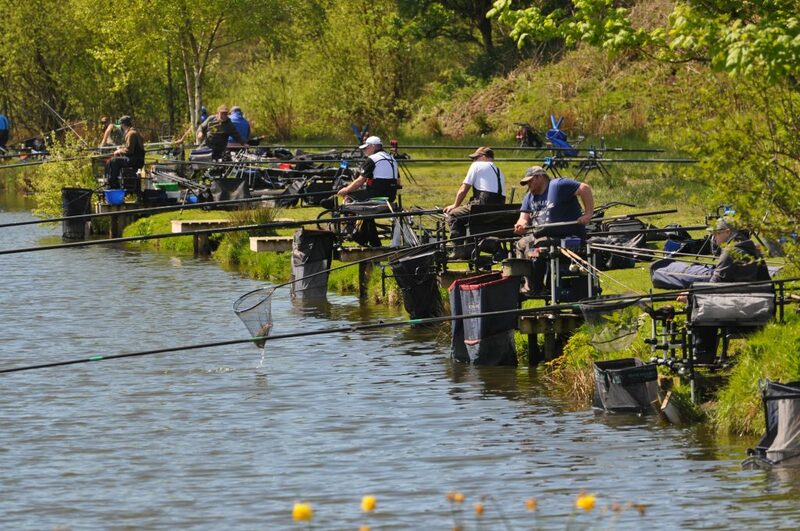 James Woodrow, Barry Young, Ian Whitson, David Corcoran, Mark Clow, Rosen Arsov, Craig Duncan, John Wright, Steve Royle, Simon Heyes, John Williamson, Mark Acton. Don Lines, David Mcgregor, Mick Slater, Matt Waugh, Myles Watt, Darren Peel, Brian Irving, Dave Walker, Matt Baxter, James Dornom, Nick Aldersey, Daryn Ritchie. Congratulations to everyone involved and good luck in the finals guys..! 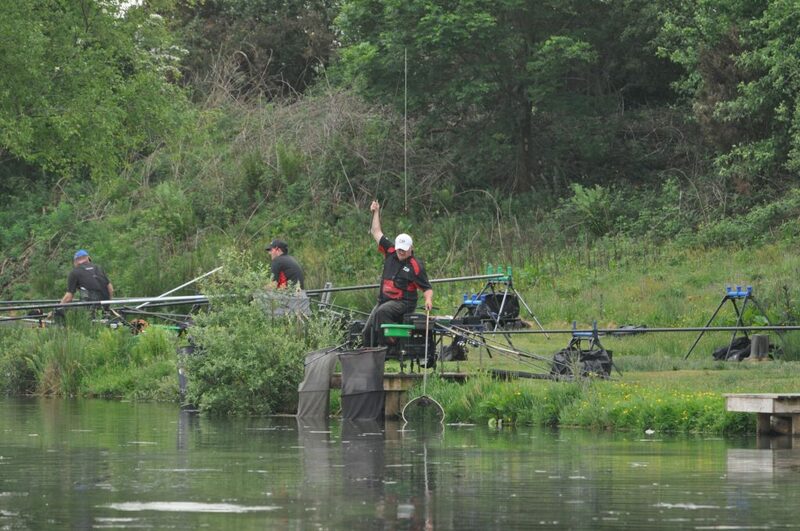 Lots of overnight rain upset the fish a little, but some very nice weights on day one of the finals. 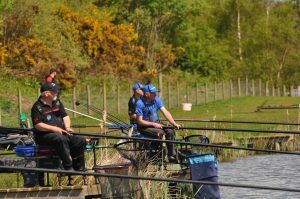 The ” A” final was held on Wallace Lake on day one, with John Williamson ( 54lbs.) & Barry Young (. 47lbs.) 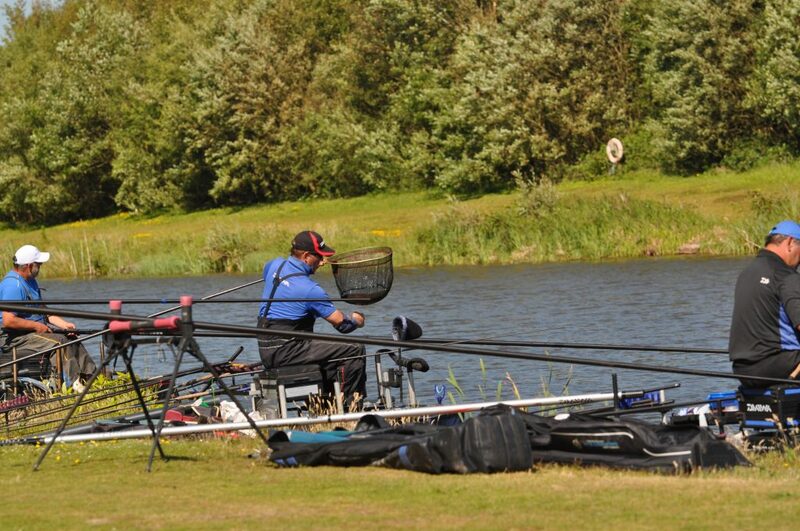 both winning their sections scoring good points going into day 2. 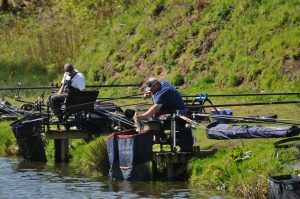 Both Ian Whitson & James Woodrow managed runner-up in their respective sections today also with it all to fish for tomorrow. 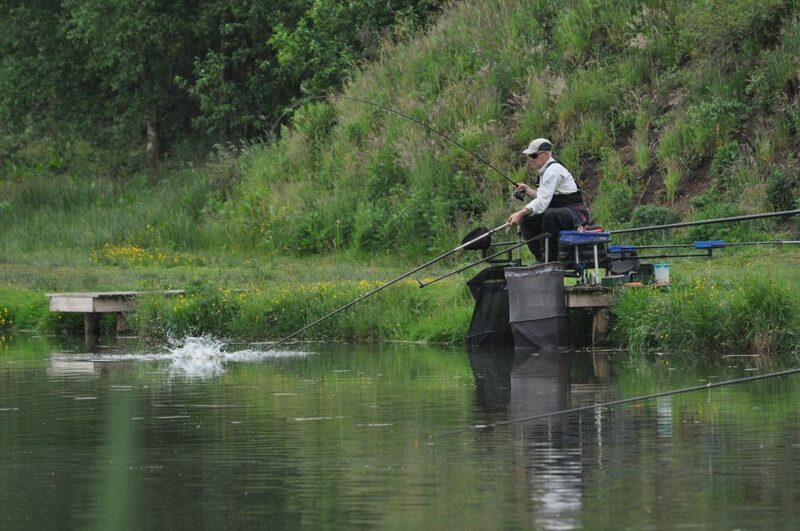 The ” B” final was held on Queensberry Water and Dave Walker (. 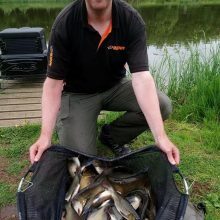 54lb 10oz. ), & Don Lines (. 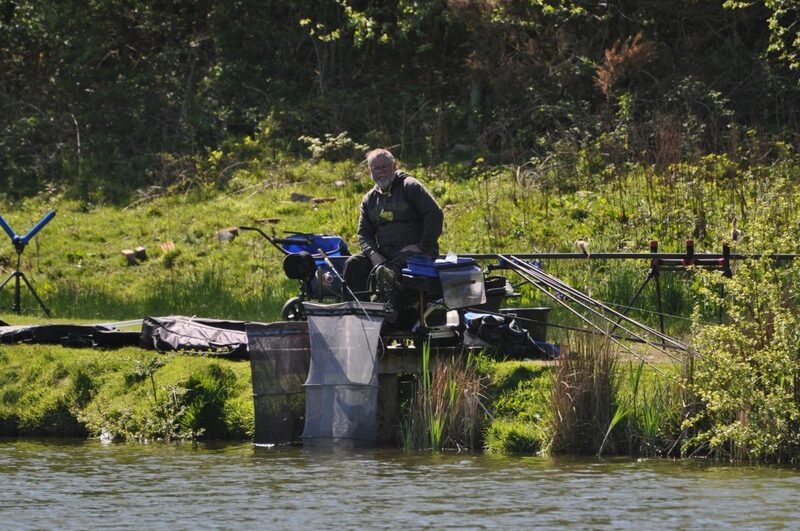 52lb 10oz.) 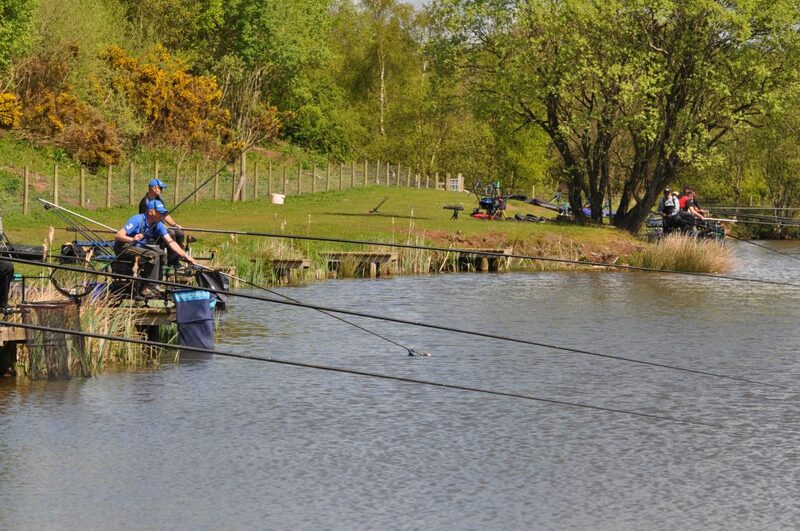 both picked up section wins, with David Mcgregor & Myles Watt securing their 2nd place points. A dull damp start to the day, but dry throughout the match, very mild ( 21 degrees), & a gentle 10mph wind… Perfect 👌 conditions. The two day ” A” final saw 12 top anglers battling it out to win the top prize of £1000, and with smaller tighter sections, it remained close going into day 2 for all concerned. 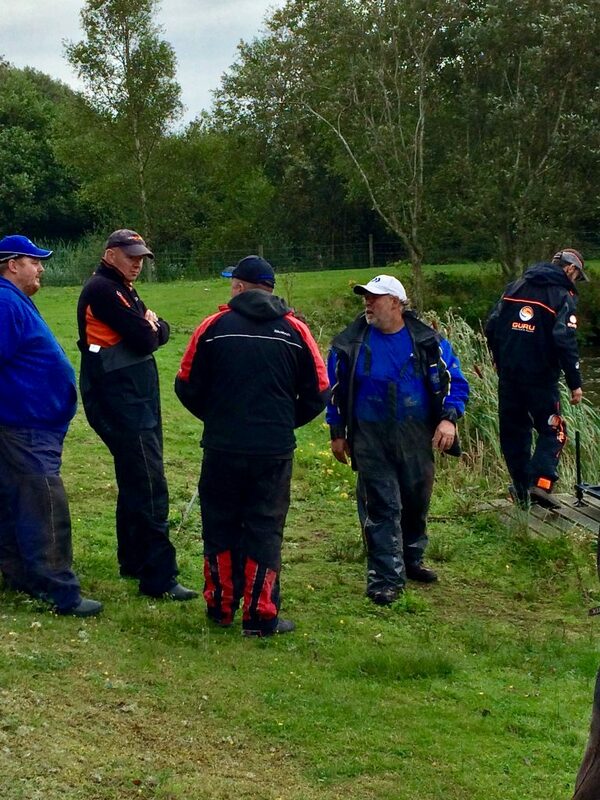 With John Williamson and Barry Young winning their respective sections yesterday, it was typical they ended up in the same section today. 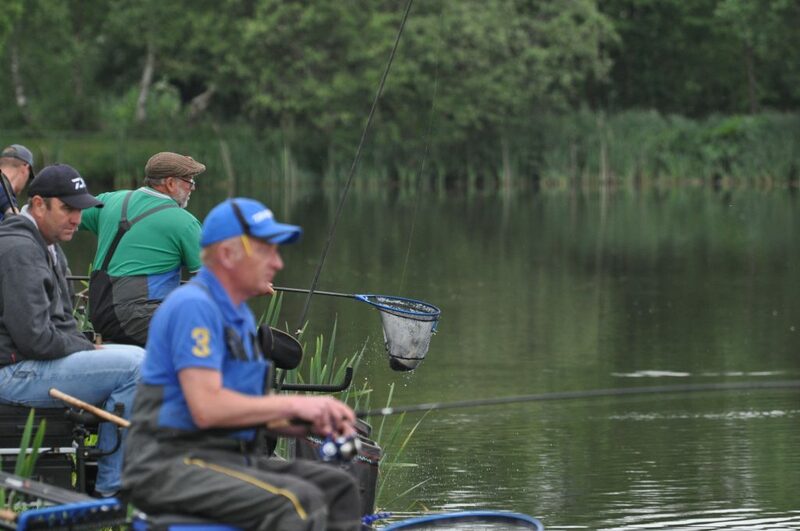 With yesterday’s runners-up James Woodrow and Ian Whitson in with a great shout also, including the rest of the chasing pack, it was all to fish for today. 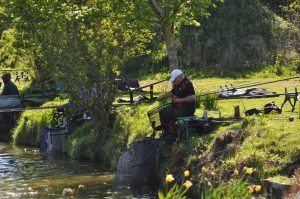 At the draw, Barry Young pulled out his favourite peg 20, and with John Williamson and Ian Whitson in the same section, it was going to be a fair old tussle. 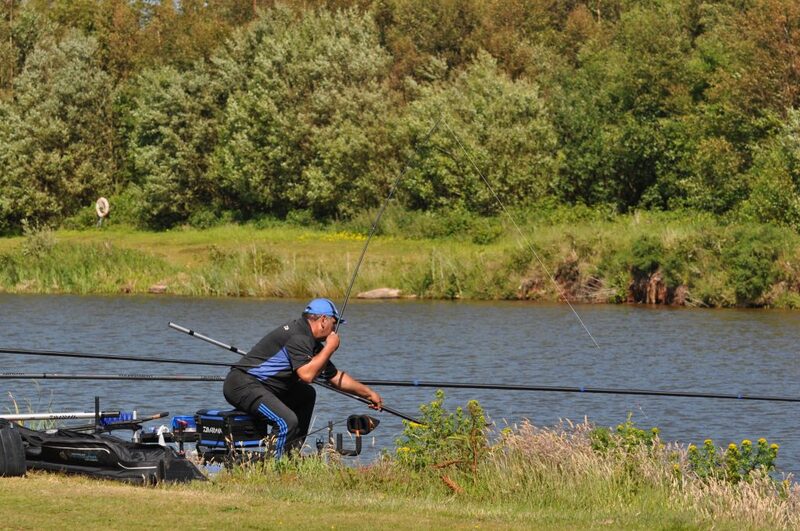 Meanwhile, James Woodrow had drawn well also, end peg 28, just to make things interesting. With a tough section also, things were up in the air in both sections. 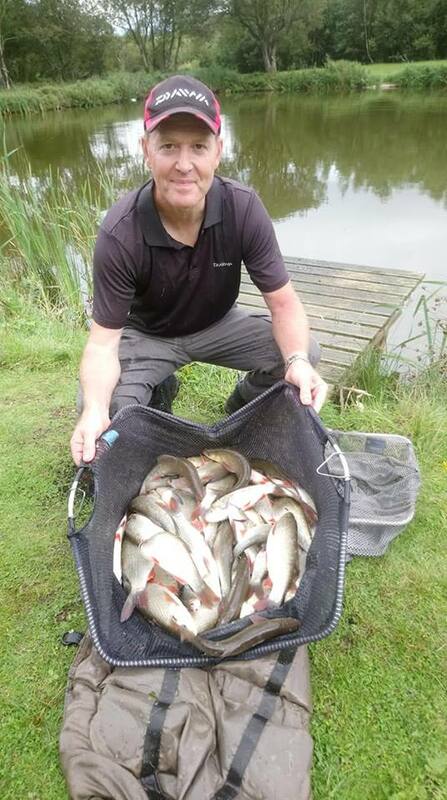 John Williamson got off to a great start with some nice Carp on the method feeder, with Ian Whitson catching steadily also. 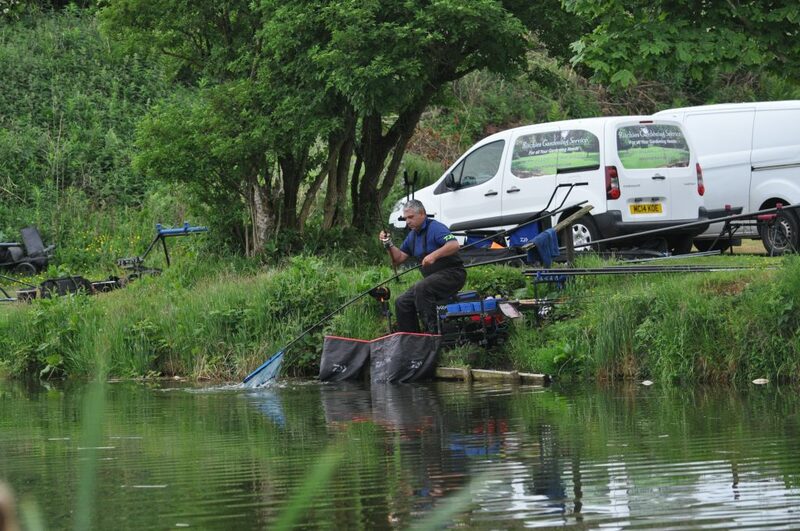 Barry Young was struggling at this point with one small carp in the first hour. 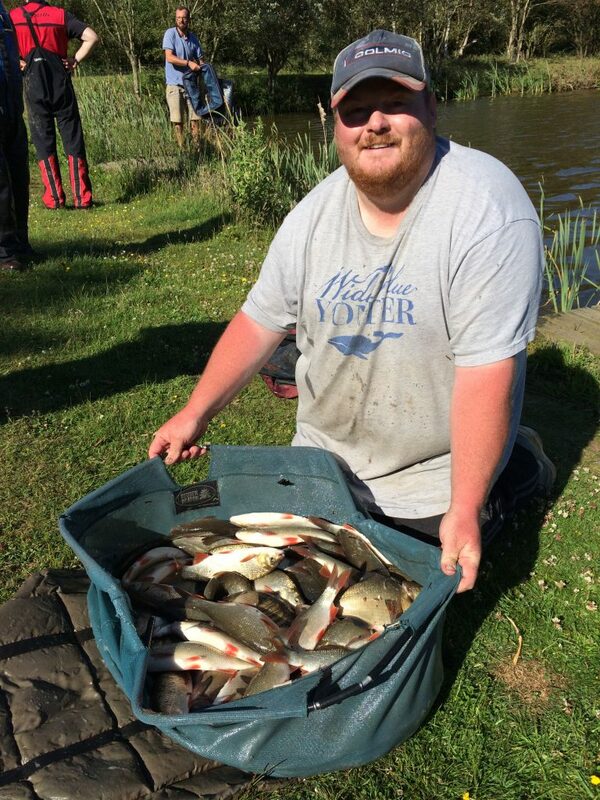 Meanwhile, in section 2, Simon Heyes was catching well with some real big carp adding to his weight, with Craig Duncan also going strong 💪. Surprisingly, peg 28 wasn’t firing on all cylinders today, with pole wizard James Woodrow catching but not as well as we’d thought. At the weigh-in everyone followed the scales round waiting eagerly to see who’d done well. 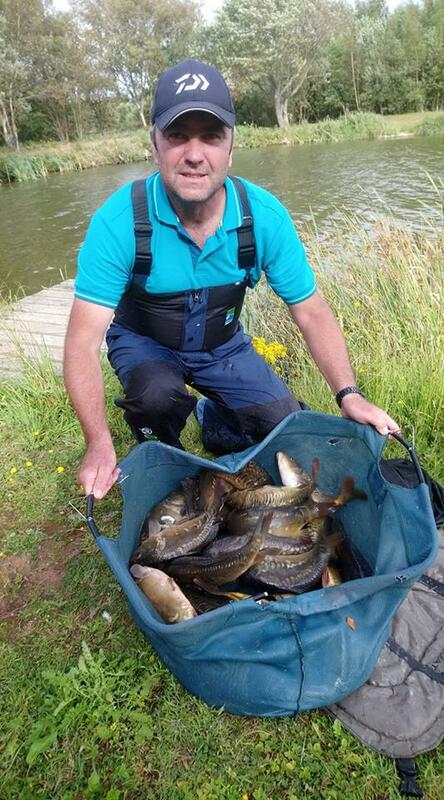 Section 1 was won by Barry Young with 61lbs 4oz, a nice net of big ide, skimmers and 5 small carp. 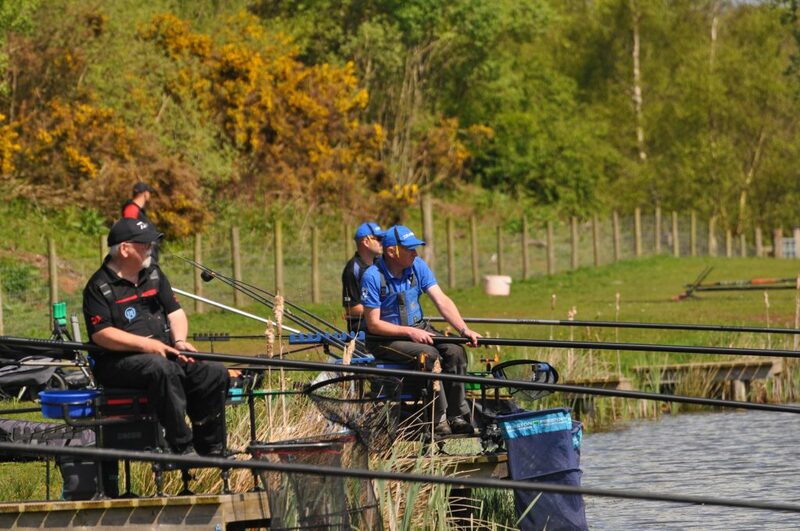 Both Ian Whitson and John Williamson pushed hard, finishing 2nd & 3rd respectively. 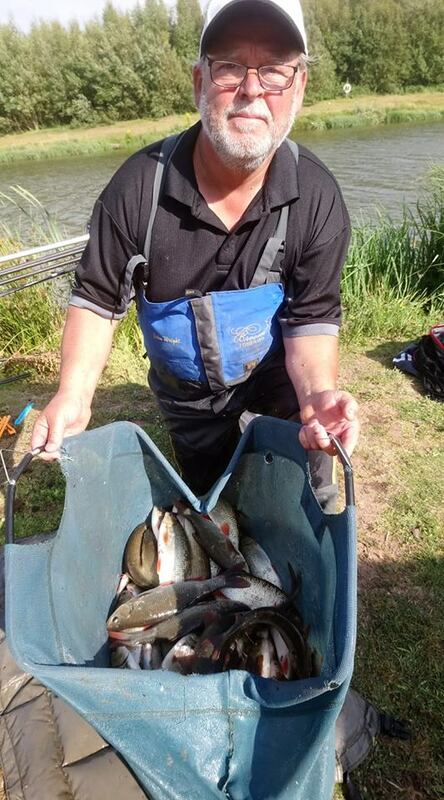 Victory was sealed for Barry Young with a perfect score of 2 section wins / 2pts, picking up the top £1000 prize. 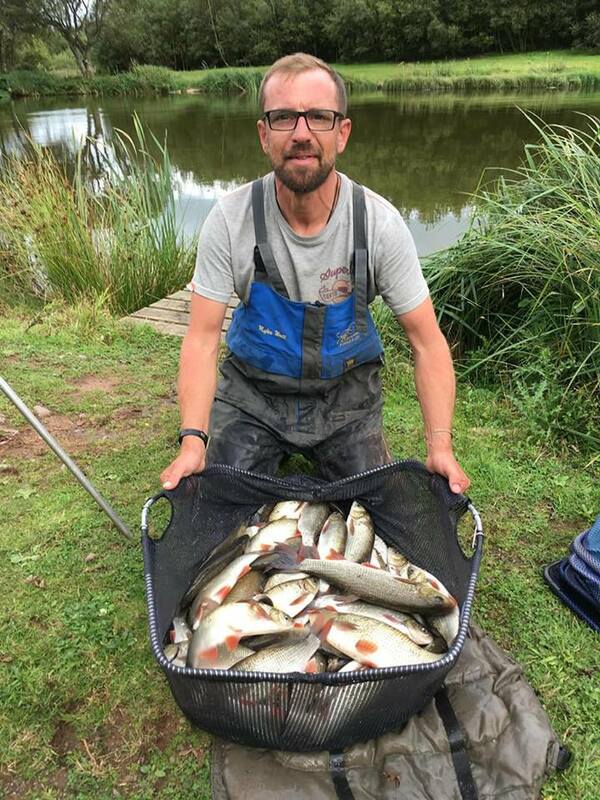 Section 2 was a tight affair also, but the winner didn’t come from where everyone expected, instead it was Symon Heyes who put in a sterling performance to win from peg 23 with a cracking net of ide and big carp for 68lbs 4oz, winning the section and also 2nd overall in the two day final.! 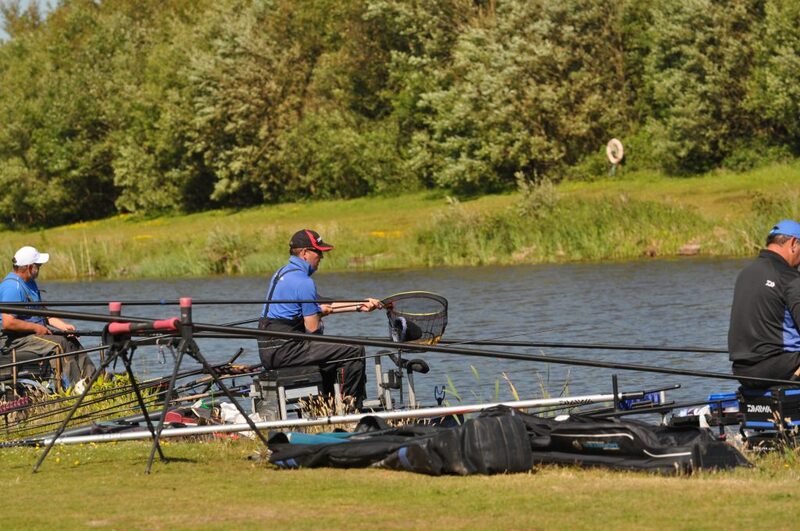 Craig Duncan pushed hard with a superb 51lb 4oz to finish 2nd in section. 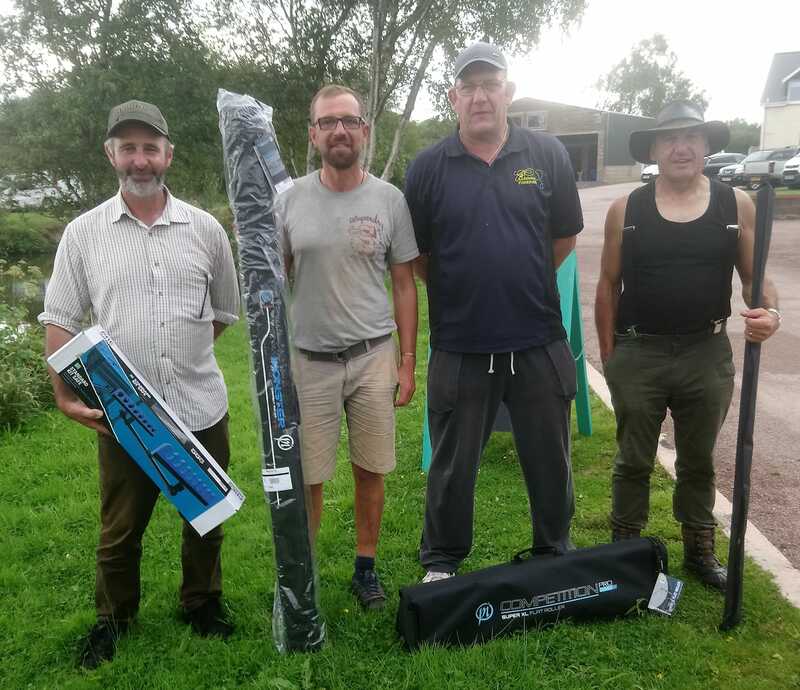 Wallace Lake Section 1 was won by Dave Walker, and with a section win from yesterday, it secured him the ” B” final overall winners place, picking up a nice Preston ” Carbon – Active” 13ft waggler rod plus pools for his efforts. 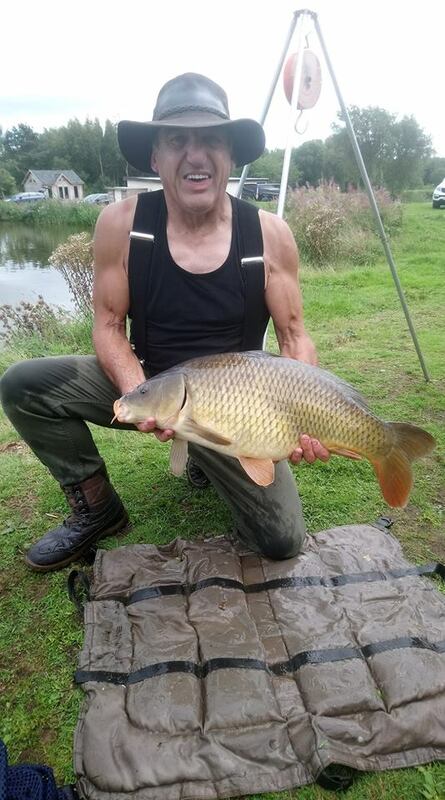 A great weight today of 74lb 14oz for Dave which included a cracking 15lb common carp. 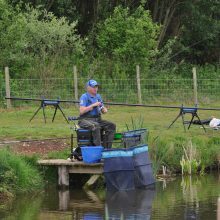 Matt Baxter was a very close 2nd in section with 71lb 12oz, also earning him 4th overall and picking up a Preston pole roost. 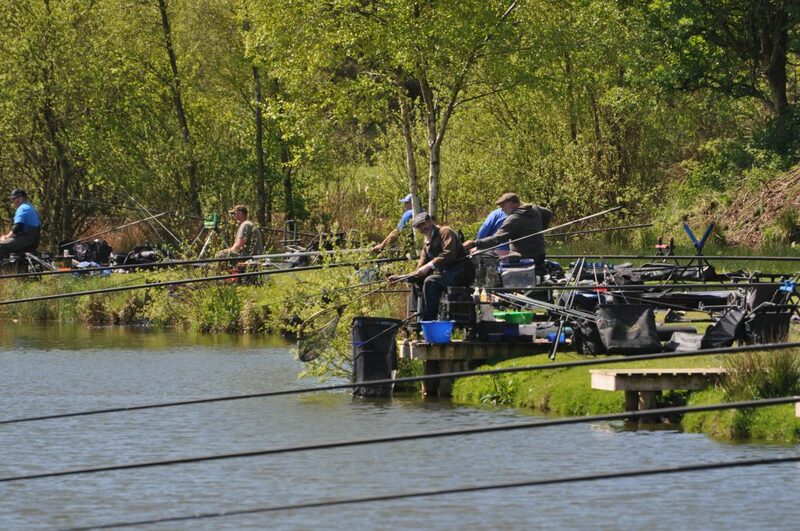 Section 2 fished equally as well, with Don Lines weighing in a superb mix of ide and carp caught on pole for 73lbs 12oz, securing 2nd overall in the ” B” final, picking up a Preston pole roller too. 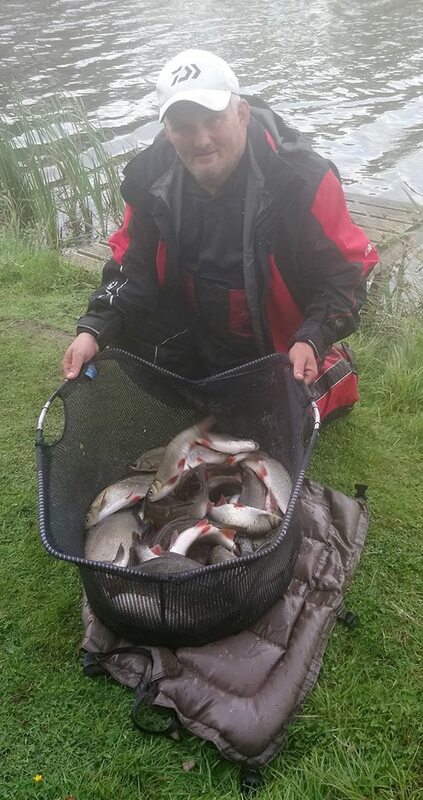 Myles Watt also did well-catching ide on the pole for 69lbs, finishing 2nd in section and 3rd overall in the ” B” final, picking up a Preston Rod holdall. 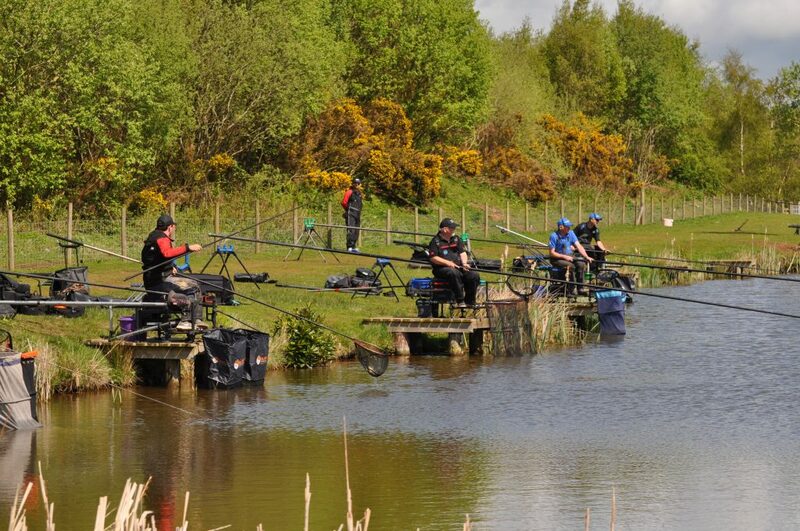 A fantastic end to the series, but disappointing turnout out for the ” B” final with 6 anglers absent. 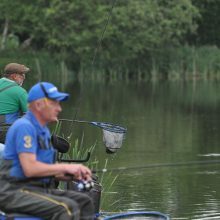 Many thanks to all who’ve supported this year’s Broom Series, a great summer league with all the usual great laughs along the way., from all at Broom.